My geeky tattoo is from the Dune series by Frank Herbert. It’s the red hawk House Atreides crest. The movie/miniseries that was made based off the original novel used a different, much lamer interpretation of the crest. I like mine more :) Anyways, the series has influenced me more than any other book series, so I thought it appropriate to get it as my first big tattoo! 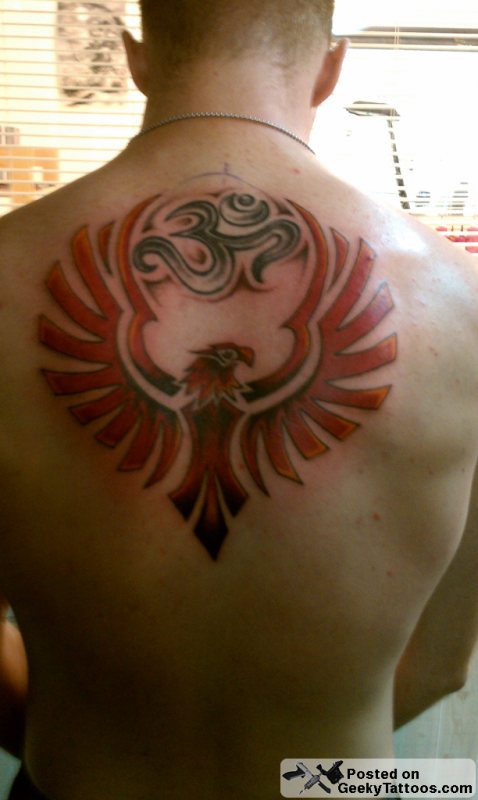 The Ohm that the wings go around was my first tattoo, not technically part of the House Atreides crest…. but it works. I think Frank Herbert would approve! I got the tattoo at The Lazy Dragon, which is right outside Fort Leonard Wood, MO. I don’t believe that they have a website yet. If you’re in the area and you like this tattoo, go to the Lazy Dragon and ask for Pat! Tagged with back, Dune, The Lazy Dragon.